What’s that? If a tenrec could speak, this would likely be the first thing out of its mouth: “I’m not a hedgehog!” It doesn’t help that of the nearly 30 different tenrec species, two of them have the word hedgehog in their name. There is a greater hedgehog tenrec Setifer setosus and a smaller, semi-arboreal lesser hedgehog tenrec Echinops telfairi. We have the “lesser” type at the Zoo and Safari Park. The lesser hedgehog tenrec is a kitten-sized, stout-bodied, nocturnal mammal endemic to Madagascar. Its back is covered in sharp, cream- and dark-colored spines, which serve as an effective defense when the animal rolls into a ball. It has a longish nose with sensitive whiskers and prominent ears, all useful in finding food and mates. Its eyes are tiny. This tenrec has zalambdodont dentition, meaning their molars form a V-shape. While aquatic tenrecs have webbed toes, the land-loving lesser variety does not. The lesser hedgehog tenrec has strong, grasping toes with tiny hooked claws, enabling them to keep a grip on all but the smoothest of surfaces. They can even hang by one foot or even a toe while climbing. Stayin' alive. These small mammals can become a meal for birds of prey, snakes, and fossa. When this animal is threatened, it rolls into a ball, exposing its spiny covering and protecting its underbelly. The spiny ball is nearly impenetrable. Continued provocation can elicit it coming out of its ball and advancing, gaping, and head bucking to the threat. Should a predator dare to bite the tenrec, it can be left with a mouthful of short quills. Types of tenrec. The tenrec family and their closest relatives, the otter shrews and golden moles, have the greatest diversity of any living family of insectivores. Interestingly, they evolved in isolation, with tenrecs living in Madagascar, otter shews in west and central Africa, and golden moles in southern Africa. The tenrec was likely the first mammal to land on Madagascar millions of years ago, so the early lineage evolved over generations to adapt its body shape to its environment. Through a process called “adaptive radiation,” new tenrec species appeared, each physically suited for its ecological niche and free of competition, according to the International Union for Conservation of Nature (IUCN)/SSC Afrotheria Specialist Group. The group ranges from the velvety-soft giant otter shrew, to the water-loving aquatic tenrec, to the punk rocker-looking streaked tenrec. They are mostly nocturnal and rely on their sensitive whiskers and keen sense of smell and hearing to find food. The Tenrecinae are spiny tenrecs. The largest species is the tailless tenrec, Tenrec ecaudatus, which weighs up to 2.2 pounds (1 kilogram). It is as large as a rabbit, and is less spiny than the other species. In addition to the two species of hedgehog tenrec Setifer setosus and Echinops telfairi, are the two species of streaked tenrec Hemicentetes semispinosus and H. nigriceps. Many people confuse lesser tenrecs with the hedgehog species found in pet stores, but these are not the same animals; hedgehogs are members of a different order, Erinaceomorpha. The wild west. 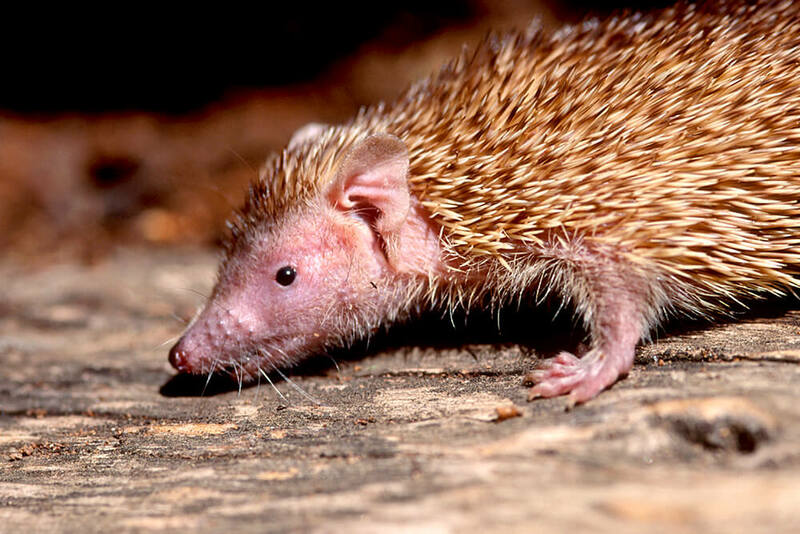 The lesser hedgehog tenrec is found in the dry deciduous forest areas of western Madagascar and the xerophytic spiny forest and gallery regions of southwest Madagascar. Nocturnal and flexible in behavior, it can also inhabit grassland and farmland near human habitations. They rest in tree hollows by day, making a cozy den. They tend to be solitary, though they have been seen grouped together during a period of torpor. In North America, the animals slip into torpor from October to March, which coincides with our winter. Tenrec torpor. The lesser hedgehog tenrec can be found both in trees and living on the ground. It is mostly nocturnal, sleeping by day (often resting in a tree hollow) and foraging for food at night. It fills the same niche as mice, hedgehogs, shrews, and opossums found in other regions. During the cool, dry season from May to October, when food is harder to come by, these animals can slip into a dormant state called torpor. During this time, its body temperature drops and its metabolism slows, which helps conserve energy. A tenrec’s torpor can last three to five months! Delicious diet. The lesser hedgehog tenrec is classified as an insectivore, but is actually an omnivore. In addition to eating insects and their larvae on the ground or in trees, it can also prey upon small vertebrates and bird eggs and it occasionally consumes fruit. At the Zoo and Safari Park, these little spined wonders are given Mazuri insectivore diet, mealworms, and a variety of fresh produce. Raising tenrecs. Following a period of torpor during the cold season, these tenrecs mate after they emerge from the den, usually in October. Gestation is 61 to 68 days after which a litter of 5 to 7 (but up to 10) youngsters is born, usually during the wet season when more prey is available. The young are tiny, helpless, and weigh about eight grams. After about a month, they become independent. However, some tenrec species are among the most reproductively robust species on the planet: they can have litters of 32 young, which emerge from the burrow and are actively feeding with their mother at 18 to 20 days old. The large-eared tenrec takes motherhood one step further with post-partum estrus, meaning females are able to nurse one litter while another is developing in the uterus. This unusual reproductive strategy may be in response to extremely dry conditions where it lives. This strategy, though energetically taxing, allows it to maximize reproductive “output” during optimal conditions. Hear that? Tenrec vocalizations include hissing and grunting to twittering and echolocation clicks. Some species communicate by rattling their spines. They mostly use tactile and scent to communicate with their own kind. Smell that? One interesting behavior (though probably not surprising given their penchant for solitary living) is self-anointing or scent marking, which is common after cage cleaning, after new objects are added to its environment, or even while being held by a human. The animal spreads its saliva on the substrate and on its flanks using its front paws. Nice to meet you! 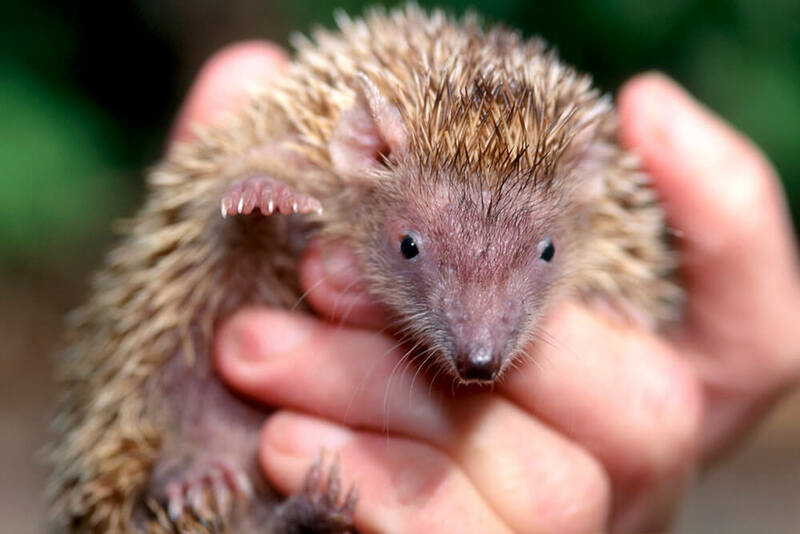 Lesser hedgehog tenrecs are animal ambassadors at the Zoo and Safari Park. They can be seen in behind-the-scenes safaris and special presentations. Tropical hazards. While habitat loss is a chronic threat for island dwellers (even on a large island like Madagascar), and will likely impact tenrec populations throughout their range, the IUCN currently lists this species as Stable. The main threat to members of the Tenrecidae (and countless other species), is the ongoing destruction of forests for slash-and-burn agriculture, charcoal, and cattle pasture. In some areas, both greater and lesser hedgehog tenrecs are hunted for meat, while other cultures consider them taboo (called fady on the island). Body: Up to 7 inches (18 centimeters) long, plus a .5 inch (18 millimeters) long tail. These animals can enter torpor to conserve energy for three to five months; they can also enter torpor on a daily basis when it is hot outside. 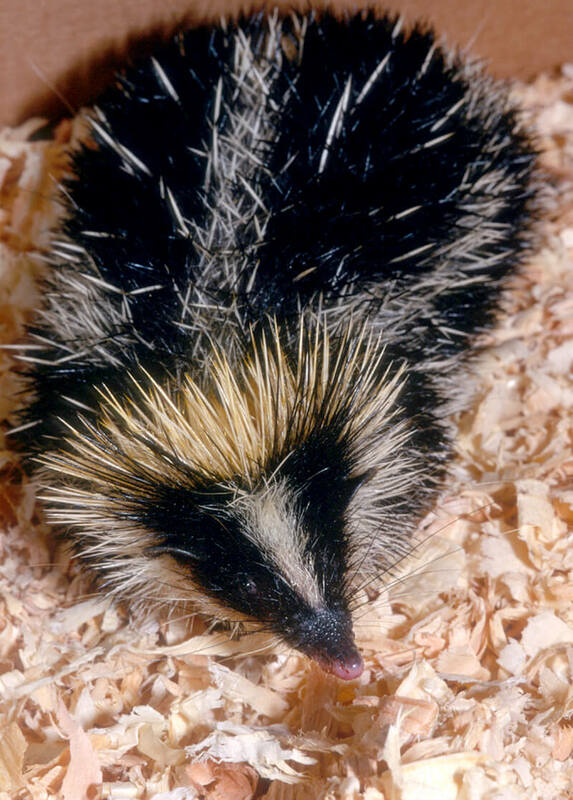 Most tenrec species live on Madagascar, but some can be found on mainland Africa and the Comoro Islands. The closest relatives to the tenrec family are otter shrews and golden moles (not hedgehogs). A notable difference between hedgehogs and tenrecs: the former will hiss at potential predators while still rolled in a prickly ball, while a tenrec will uncurl and attack a potential threat. Tenrecs have relatively low body temperature with a range of 86 to 95 degrees Fahrenheit (30 to 35 degrees Celsius). Its spines can be lifted and lowered using its well-developed muscle under the skin called the panniculus carnosus. The lesser hedgehog tenrec’s scientific name Echinops telfairi honors British naturalist, Charles Telfair.